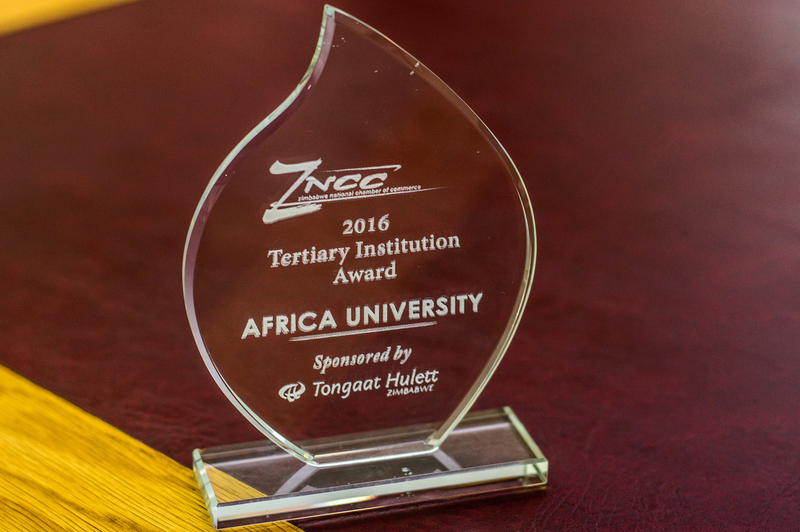 Africa University has been awarded the 2016 Tertiary Institution Award by the Zimbabwe National Chamber of Commerce (ZNCC). The awards were held at Golden Peacock Villa Hotel, Mutare earlier this month. This recent award has made Africa University a 3 time winner of ZNCC awards. Prior to this award, the University has been awarded the Best Education Sector Award and the Agribusiness Award. Africa University is committed to providing an education experience that is sensitive to the needs of knowledge seekers and relevant to industry, commerce and the overall growth and prosperity to Zimbabwe and the entire African continent. The institution which was established in 1992, has an alumni network of over 8 000 graduates who have proved to be movers and shakers, making a difference to human lives and economies all over Africa. ZNCC is recognized to be the unified “Voice of Business” in Zimbabwe. Annually, they host a nationally recognized awards ceremony in Zimbabwe to celebrate businesses and organizations which are playing a pivotal role in driving economic growth and development in Zimbabwe.